The Year 1 Challenge is a workout journal companion to the bestselling book Bigger Leaner Stronger, and it contains an entire year of workouts. With the Bigger Leaner Stronger program, you can gain 20 – 25 pounds of muscle or lose 30 – 35 pounds of fat in just one year, and this workout journal gives you the workouts you need to get there. All workouts are properly laid out so you can record and track your progress, and the journal also features some of the author’s favorite motivational quotes, as well as recipes from his bestselling cookbooks, The Shredded Chef and Eat Green Get Lean. 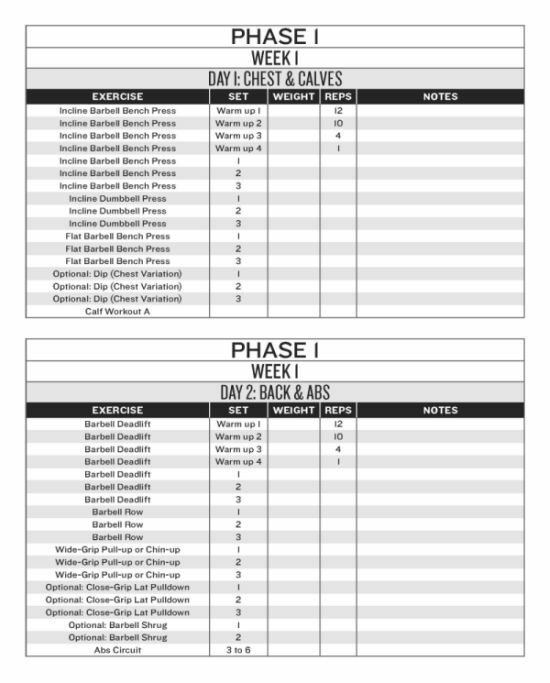 Here’s how the workouts are laid out, in case you’re wondering: If you’re ready to build muscle and lose fat faster than you ever thought possible, buy this journal today, get started on the program, and watch your body transform week after week.